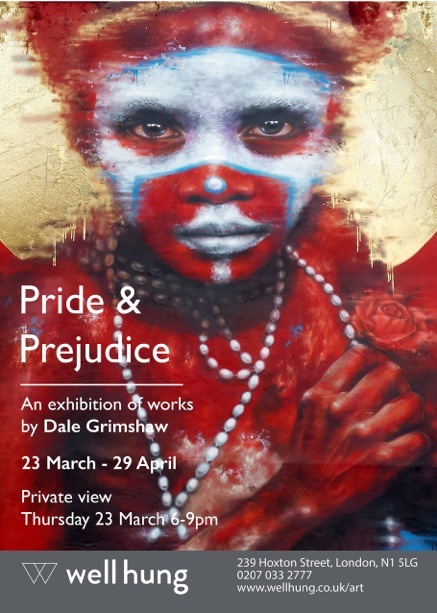 We are looking forward to Pride & Prejudice, the new show from Dale Grimshaw at WellHung gallery and guess what? We have two signed posters of the flyer show (see left) to give away to two of our readers so get involved and refer to panel on the right. 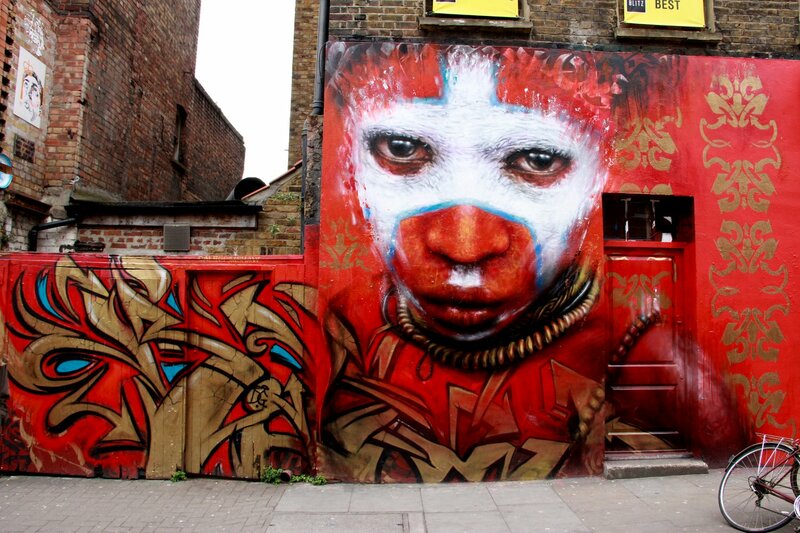 Well Hung are delighted to announce Dale Grimshaw’s first solo show at Well Hung Gallery. Pride and Prejudice brings together a body of work based on a ‘two worlds’ theme that Dale has been developing over the last few years. The work contains a strong political message, depicting portraits of threatened indigenous people, mostly from Papua New Guinea, which collide with familiar symbols of the privileged western world, producing a jarring effect that emphasises their powerlessness. Dale Grimshaw was born in Lancashire, in the North of England. During a difficult childhood, his drawing and painting became extremely important to him. He developed his skills at college, firstly with an Art Foundation course at Blackburn College and later to Degree Level, studying Fine Art at Middlesex University. 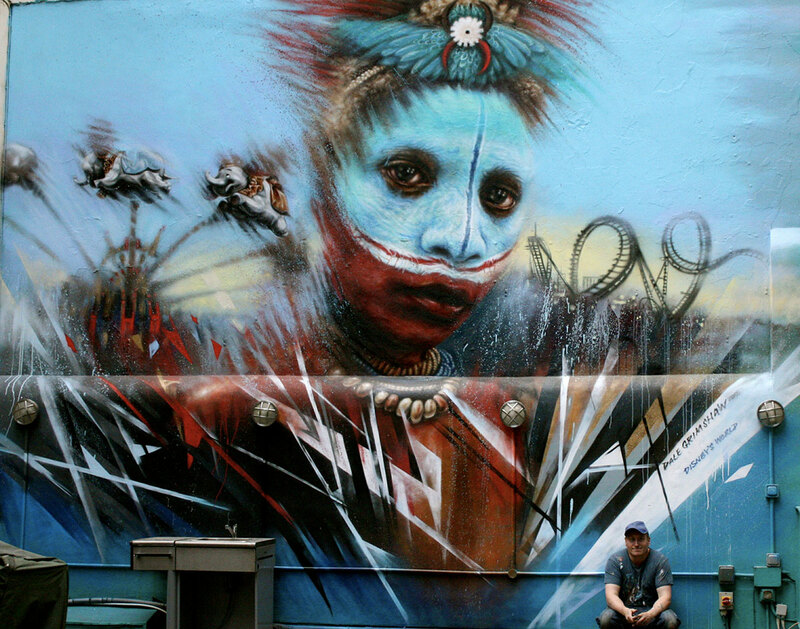 Dale Grimshaw has a successful gallery career, having exhibited extensively both nationally and internationally, including five solo exhibitions with Signal Gallery, London. His exhibitions have been widely recognised in the press and online, articles have been published in The Independent, Juztapoz, Art of England Magazine and Widewalls. His works are collected internationally, alongside celebrities including Adam Ant and The Prodigy. 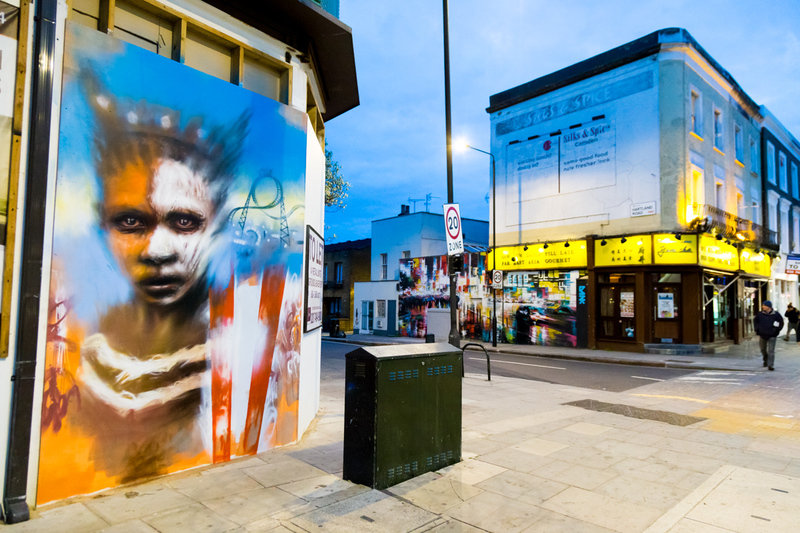 More recently Dale has been invited to festivals nationally and internationally as well as painting many iconic walls across London, where he lives. Private view from 6pm until 9.30pm is on Thursday 23rd March. Music and refreshments will be provided, the event is open to all but please do email info@wellhung.co.uk to confirm attendance. Admission is, as always, free.